Nell Pratt’s search into a family’s history may bring more than just dark secrets to light…Nell Pratt, president of the Pennsylvania Antiquarian Society, is intrigued when Arthur Logan, elderly scion of an old Philadelphia family, approaches her to search the Society’s archives for information on the Logan family’s history. 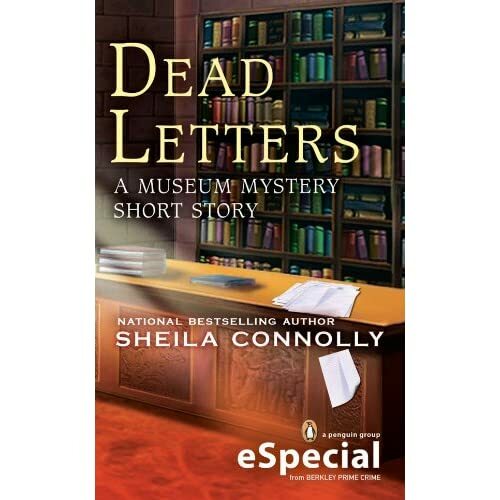 What he desires most, it turns out, is her discretion—but as Nell begins sifting through documents and letters, a series of unsettling occurrences lead her to wonder if she’s not the only one out there looking for a Logan family secret… Includes an interview with the author and a preview of the next Museum Mystery: FIRE ENGINE DEAD. College librarian and struggling artist India Hayes isn't sure how her older sister Carmen talked her into managing a face-painting booth at the Stripling, Ohio, Founders' Day Festival or how Carmen convinced her to wear the pink gingham pioneer dress, including mobcap and granny boots, but that's where she finds herself in a chilly October just before Halloween. India's annoyance turns to suspicion as she discovers the body of Zen-like basket weaver, Tess Ross, on the festival grounds. Tess leaves behind an angry blacksmith husband, a confused adopted son, greedy siblings, a dysfunctional artists' co-op, and a chocolate-colored labradoodle with a two-million-dollar trust in his name. Much to India's dismay, she learns Tess is the sister of her stuffy college provost, Samuel Lepcheck, and the mother of a library student worker, Derek, who has an irrepressible crush on India that she's doing her best to ignore. Derek begs India to investigate his mother's murder. Despite the urgings of handsome Police Detective Rick Mains to stay out of the investigation, India agrees to Derek's request and finds herself playing sleuth as well as foster-owner to Zacchaeus, the two-million-dollar labradoodle. With her own eccentric family commenting from the sidelines and her Irish-centric landlady, Ina Carroll, as volunteer sidekick, India must discover the truth before she has a permanent canine houseguest or she ends up the next victim in the basket weaver's murder.